Over 150 guests attended a reception at Bisham Abbey National Sports Centre to celebrate the 30th anniversary of national charity, The Wheelyboat Trust. 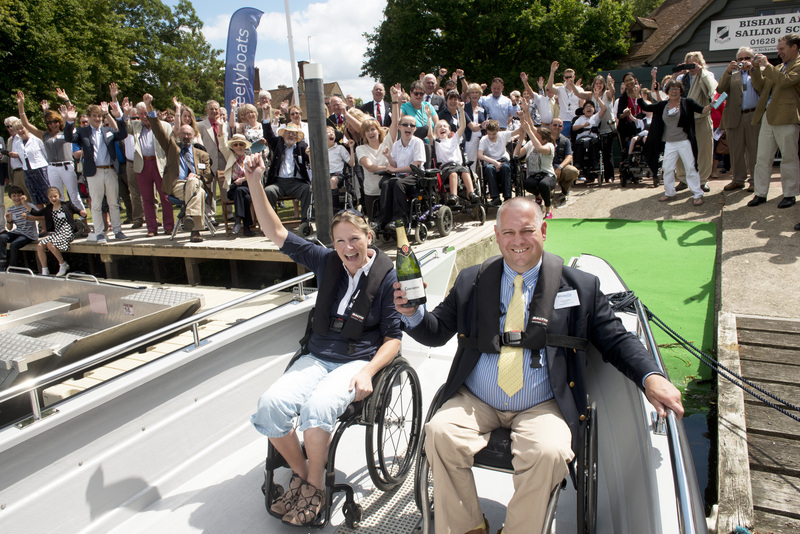 The occasion also marked the launch of the Coulam Wheelyboat V20 – a brand new model and the most versatile developed to date. It is the 160th Wheelyboat to be launched by the Trust, and being based at Bisham Abbey Sailing & Navigation School, it will be the first Wheelyboat to operate anywhere on the River Thames, as part of the Boatability project in collaboration with the Rivertime Boat Trust, which aims to increase disabled people’s active participation in watersports. The Wheelyboat Trust is a national charity that provides disabled people with the opportunity and freedom to enjoy water-based activities all over the UK, for sport, wildlife watching, recreation or rehabilitation purposes. The specially designed Wheelyboats are simple to board via their roll-on, roll-off bow ramps and their level deck provides access to every corner of the boat including the helm, overcoming practical difficulties and providing disabled users with independence to make the entire water accessible. In celebration of opening up disabled access on the waters of the Thames, a fleet of Wheelyboat models sailed past Bisham Abbey, with students from Manor Green School in Maidenhead on board, demonstrating the opportunities that Wheelyboats bring to those with disabilities or limited mobility. Hosted by the charity’s president the Duke of Roxburghe, the event featured an inspirational speech from Claire Lomas, a sportswoman, author and disability campaigner. Lomas famously walked the 2012 London Marathon in 17 days in a pioneering robotic suit following a life-changing eventing accident which left her paralysed.